There was no distinction made between "ponies" and "horses" until much later in history. No conclusions about size can be drawn from a modern translation of any ancient word as "horse". The chariot burial at Wetwang (Yorkshire; 300-100 BC) yielded a bronze jointed snaffle bit of 3.5 inches. 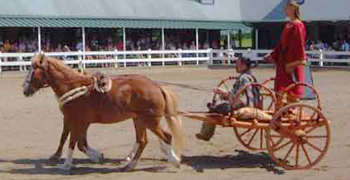 A reconstruction of the chariot at the Kentucky Horse Park (June 2003; right) is pulled by ponies of 12 hands - and even these need a 4 inch bit. The Romans and Celts were probably smaller than modern men. Vegetius, in De Re Militari, laid down heights for the selection of cavalrymen and first line infantry in 390 AD: "We find the ancients very fond of procuring the tallest men they could for the service, since the standard for the cavalry of the wings and for the infantry of the first legionary cohorts was fixed at six feet, or at least five feet ten inches. These requirements might easily be kept up in those times when such numbers followed the profession of arms and before it was the fashion for the flower of Roman youth to devote themselves to the civil offices of state." The saddles should have large and thick cloths; the bridles should be of good quality; attached to the saddles should be two iron stirrups (skala), a lasso with thong, hobbles, a saddle bag large enough to hold three or four days' rations for the soldier when needed. In the civilian as well as the military world, people may have ridden the intermediate sized ponies; loaded packs onto the smallest (not so far to lift things), and used the largest for heavy transport work (plenty of muscle and weight to move heavy wagons) or as heavy cavalry. Animals were described by their suitability to the various jobs, so they were types rather than breeds, much as cobs and hunters are today. With regard to our Cumbrian breeds, big "horses" find it very hard to thrive on the northern fells, so whether or not cross breeding occurred, by natural selection the wild northern type probably remained as what we would call a "pony". Two later bronze bits have been found at Middlebie (Dumfries, Scotland; 0-100 AD). Both are decorated straight bar snaffles. They measure in the 3.5" to 4" range. One is for a pony in a pair, the other is symmetrical and might be for a single pony. The bit rings bear clear signs of wear so they were not just ceremonial items but were made to fit real, small animals and were in regular use. A bit found at Rise, East Yorkshire, is a thick bronze snaffle whose mouth is roughly 3" wide. This tiny mouthpiece (left, seen from above to show the ring holes) would only fit a small pony of under 11 hands high if the horsemen used the same methods of fitting as we do when fitting bits today. Perhaps the side extensions of the bit rings were intended to lie partly between the ponies' lips. We don't know for certain how snugly they were fitted. However, the rings themselves are only 4" apart when the bit is laid flat so the ponies must still have been small. It dates from between AD 40 and AD 100. "It may hence be assumed that while some of the horses belonging to the auxiliaries who garrisoned the Newstead Fort measured nearly 15 hands, the majority were below rather than above 14 hands. In all probability the better bred horses, measuring about 14 hands, belonged to the cavalry and the mounted men (about one in four) attached to the infantry regiments, while the coarse-headed animals were as a rule used for transport. As the Gauls, from the second century onwards, had been improving their horses by means of well-bred stallions imported at great cost from the South of Europe, the majority of the horses belonging to the cavalry and mounted infantry probably came originally from Gaul. The more powerful large-headed animals, on the other hand, probably came from Germany—belonged, in fact, to the 'bad and ugly' native German breeds referred to by Caesar." The photo at left is the tombstone of Flavinus, a standardbearer from the crack fighting unit, the Ala Augusta Gallorum Petriana milliaria civium Romanorum or Ala Petriana. He is shown riding over a bearded warrior. The 9-foot-high stone now stands in Hexham Abbey, where it was found in 1881 among the foundations of the 12th Century eastern section of the cloister. Because there is no known Roman station at Hexham, it has been assumed that Flavinus died when the Ala was stationed at Corbridge during the period before 130 AD, and that the stone was later moved to Hexham. The reason for its removal is not known. 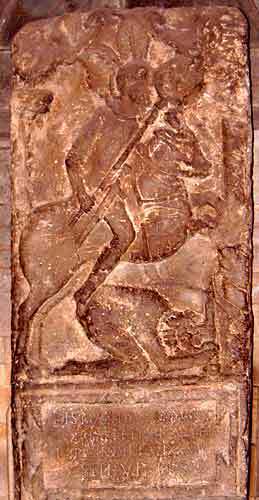 The sculptor has shortened the horse to fit onto the sandstone slab, and, following a fashion for showing the success of Roman cavalry over the barbarians, he has extended Flavinus' leg from the knee down so he can "boot" the enemy's backside! [To the Gods and the Departed Dead, Flavinus, Horseman of the Petrian Cavalry, Standardbearer of the Troop of Candidus, twenty-five years of age, with seven years' service, is laid here.] An excellent and informative gallery of images of Roman tombstones is online at RomanArmy.com. What about evidence from bones? Measurements taken from bones excavated in Southern England support the bit evidence. Ponies, mostly between 11 and 12.2 hands, lived in association with people in Late Iron Age to Roman times. There is also some evidence of bigger animals both in the Roman period and later. Note the number of examples recorded for each period. Pictish carvings show small ponies in comparison to their riders. One (left) in the Churchyard at Inverurie, Aberdeen, shows a pony in some detail moving diagonally ("square" trotting); others are depicted moving laterally (pacing or ambling).
" ... in the Iron Age, horses (or more accurately ponies) averaged 12.1 hh in height and resembled the modern Exmoor breed in terms of overall build. Roman horses show two distinct types; the first similar to the Iron Age ponies but taller (13.3 hh), the second taller still (14-15 hh) and more heavily built (much like a modern cob). During the Saxon period there appears to be a change back to predominantly smaller (13.2 hh) but quite robust ponies. In the Medieval period the average horse appears very similar to Saxon ones, although a few relatively large individuals begin to appear." (Johnstone 1997) The horse in the Anglo-Saxon Lakenheath burial (~570 AD) was about 14 hands high although his rider is estimated to have been six feet tall.